Japan is keen to assist Sri Lanka in its development due to country’s new political and economic reforms created by the present government, Finance Minister Ravi Karunanayake said. He said this is why Japan pledged a Yen 44 billion loan to Sri Lanka for various development projects. Minister Karunanayake made these remarks at a media briefing in Colombo today. Japan is also considering a Sakura bond issue to give US$ 1.2 billion at a low interest rates. President Maithripala Sirisena also requested the Japanese Prime Minister to provide Sri Lanka with liquid natural gas instead of coal and this proposal is also under consideration. This assistance will be used for mega development projects including monorail instead of construction of houses and roads, other infrastructure facilities and welfare projects, he said. “We have to repay the debts that the Rajapaksa regime took. We first must get out of the debt trap created by taking massive loans. Otherwise, the debt burden could further rise and the economy of the country would be in a trouble. 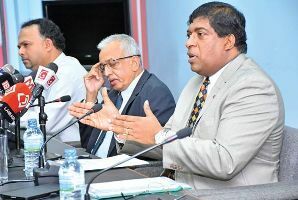 We are getting the loans at very low interest rates and this is the difference between our government and the former regime,” Karunanayake said. “Moreover the repayment period for the Japanese loan is 40 years and is at a very low interest rate of .01 percent. Today, people have to bear all these debt burden and we expect to save the people from the debt trap by developing this country on a systematic economic plan. Prime Minister Ranil Wickremesinghe will present this plan by June and it will require least a couple of years for the development to take place,” the minister said. Minister Karunanayake also said that the expenses for the expressway construction has come down by 21 percent since this government took office. “This is because we have not received commissions. Even though the previous government spent Rs.10 million, we are now able to reduce the cost for Rs. 8 million. We can further reduce expenses by calling for a tender procedure in the future,” the minister said.